Culinary affinities between Kosher and Neapolitan cuisine! You must be a member of the Rome Neapolitan Culture Lovers' Group to attend this activity. Would you like to join this group? And 2 glasses of wine (one white and one red). 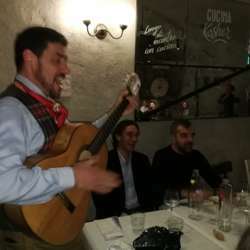 And all delivered with a background of Classic Neapolitan songs with our friendly and cheerful musician!!! I hope to see many of you for a very funny and relaxing evening! !